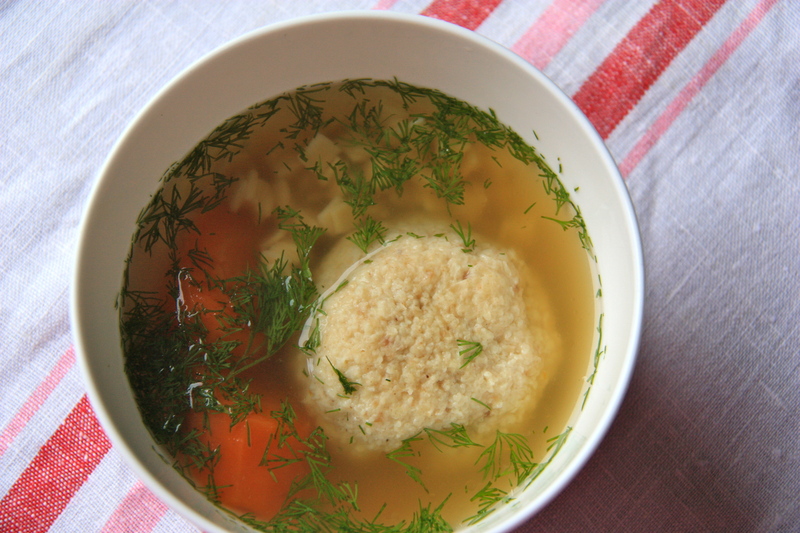 Traditionally served at Friday night dinners and holidays in Jewish households, this aromatic broth is purported to have magical healing qualities. Every balabusta worth their kosher salt has their own favorite recipe. Served with vegetables and chicken, it makes a hearty bowl. Place chicken pieces, bones, etc into a large stock pot and fill with cold water covering by 2 inches. Bring to a boil, and remove dark scum that rises to the top with a spoon. This is called skimming and ensures you have a clear broth. Reduce heat to a simmer, and add the onion, carrot, parsnip, celery, bay leaves, thyme, 2 or 3 parsley stems, with leaves removed, salt and peppercorns. Cover partially with a pot lid and simmer for 2 hours. Add the parsley and dill and continue simmering for an additional half hour. Strain the stock, reserving vegetables and chicken for serving.Taste for additional seasonings and garnish with dill and serve immediately or cool to room temperature and refrigerate or freeze. Combine all ingredients in a small bowl with a fork and refrigerate for 20 minutes. With moist hands, scoop out mixture and roll into golf ball sized balls. Drop into boiling salted water, reduce to a simmer and cover with a lid and cook for 20-30 minutes, until balls are cooked through. Serve with hot soup and enjoy! A stewing hen will yield the most flavorful broth, but regular chicken is great too! If you would like to serve the soup with noodles, cook them separately and add just before serving otherwise the noodles will soak up the broth.